Hello 2014! Truth be told, the year 2013 passed really quickly for me. I have not worked since mid June 2013, and it is as if time stopped when Asher arrived. However, I felt that much has changed in our lives. Yes, having a baby means we rarely head out in the evenings. That is a positive thing as we took time to wind down, relax and get things organised for the next day. Yes, there are sacrifices that we made. We are much more conscious about expenditure and we eat out less. We try not to plan too many things through the day as that seem to make Asher more cranky. Personally though, having a baby tested me big time. I love to be in control. Guess what, having a baby means I have to think this differently. Yes, things do not always get done- that’s ok. It will get done another day. Asher needs me to get on the floor to play with him as soon as I can. I have to remind myself, a baby isn’t a baby for long. He is going to grow and one day, I’m going to miss having this time with him. After all, it is a huge luxury to be home with him for the first year of his life. Organisation. I have two nappy bags. A bigger one with everything in it- spare clothes for me, a small rattle/book toy, spare nappies, change of clothes for him, wet wipes, lip balm, tissues..etc. It’s truly a mummy’s bag. More often though, I travel with a smaller sling bag with the bigger bag in the car. That is also a change mat which makes my life so much easier when he decides to “go” in the car and there isn’t a change room anywhere in sight. Flexibility and time management. Asher is the most awake and alert in the morning and right after his nap. I try to time and plan any activity around that period of time. We have a routine, but we do not run on a tight schedule. Oh, and always leave 5-10 minutes earlier than what I think we need. Relationship. This is an interesting one. As I’m home more often, hubby gets less stressed about needing to share his load of housework. Clothes are actually folded (more often), floors are clean. I try to do more while it is not always possible, so that when he is home, he gets more time with Asher. However, I certainly appreciate hubby even more when he hangs the clothes out before I wake up, and do the occasional vacuum! Not only that, we learn to speak to each other in a calmer manner. We argue less as the focus is us as a family-perhaps less as an individual. That is the biggest change. We think the big picture more. I love him more because I see all the smaller things he did before and all the sacrifices he has to made. Most of all, how much he adores Asher and us as a family. I thought I might start the new year with a fresh new recipe. 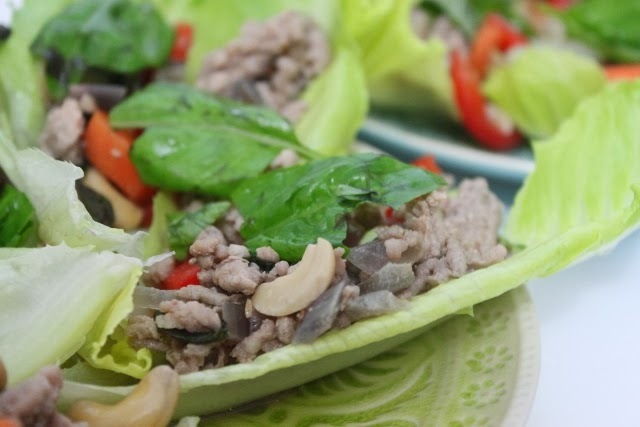 It is thai inspired and packed full of flavours. It’s also one of my “quick no fuss” meals to have handy for the week. Hubby recently started a herb garden so I’m looking forward to having fresh basil in our cooking very soon. Cos lettuce to serve with. Saute red onion, chill and garlic till done. Brown mince. Add all the vegetables with a splash of water if the mixture gets too dry. Add in all sauces and cool well. You can either toast pine nuts and add to it or add it in the pan straight up. Just before serving, add 2 bunches of basil leaves to the pan and toss through. The heat should wilt the leaves gently. 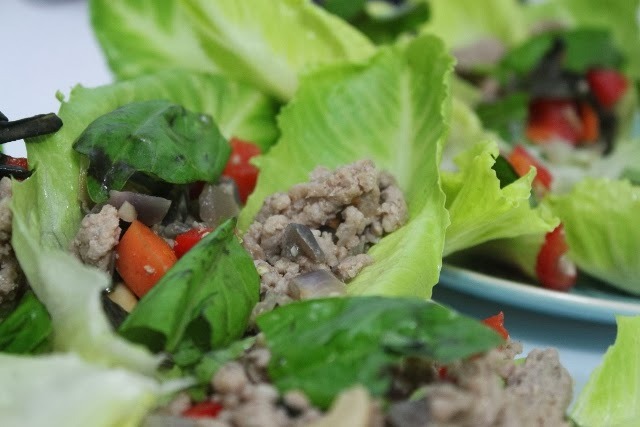 Serve on a bed of cos lettuce and more basil leaves. This entry was posted in Asher, Dinner, Eating clean, Family, Parenthood, Quick and Easy, Relationships, Salads.